The best advice on how to attract birds to your yard. In order to attract birds to your yard, you need to understand their basic needs. Attracting birds to your yard is simple. You will not only enhance your habitat, but you will be amazed at how many birds that you will see year ’round. Food can be offered in feeders, but also remember landscaping for wildlife. 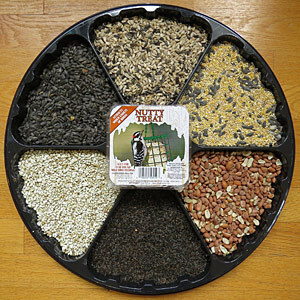 By planting native shrubs and trees that offer fruit, you may attract birds that do not eat the seed that you offer in feeders. For example, Baltimore Orioles are attracted to the nectar of flowering apple or pear trees in early spring. To take this idea a step further, consult one of our birding guides to find out what insects that migratory birds eat. Each tree and shrub has its own host of insects that it will attract. If your yard is ripe for a re-do or filling in, a little background reading will help you make the perfect decision. By selecting nursery stock that is native to your own corner of the world, you will be building a habitat that is sustaining. Along the landscaping lines, cover can be offered in the form of thickly branched or leaved shrubs. Some birds, like the very sociable Northern Catbird, will appreciate dense shrubbery both for cover and for nesting habitat. American Robins build their mud and twig nests in dense shrubbery, too. The chance to watch birds build nests and rear their young is a heart warming experience. When thinking cover or shelter, we also recommend offering a bird house, also called a nesting box. It helps to know your habitat and also what birds actually nest in a cavity in the wild. Here in Connecticut, there are only a handful of birds that use a nesting box to rear their young. These birds typically use a tree cavity in the wild, so the perfect box will mimic the size of the tree cavity. Birds such as Chickadees search for woodpecker holes in the wild, and then excavate the often rotting wood to suit their needs for rearing young. Biologists and woodworkers alike have taken note and use the dimensions of this wild cavity when thinking about a bird house for a Chickadee. Also, unless a tree could potentially fall on your house, it is helpful to leave old or dying trees in the woods near your house. The species of wildlife that rotting trees attract offer many observation opportunities. We recommend only installing one or two bird houses in your yard, as birds are secretive when nesting and for good reason. It’s survival of the fittest in your wild neighborhood, and chirping young birds will attract hawks, owls, raccoons and cats. We realize that many of you will be upset by seeing a hawk hanging out in your yard, but they are part of the natural fabric of our world, and do not kill at random but only to survive or feed young. Cats, on the other hand, are predators that will kill for sport. Please keep your cat indoors, especially during nesting season of March through July. Lastly, offering water can be a rewarding way to see birds that do not come to your yard for food. Catbirds, Rose-breasted Grosbeaks, Ruby-throated Hummingbirds, warblers, sparrows and more will appreciate even a small bird bath or water feature in your yard. Baths that we sell include hanging, post mounted, concrete, plastic, bamboo resin (green technology! ), railing mountable, all-weather, and easy to maintain models. When offering a bath, please be sure to clean your bath frequently and refill with fresh water for the health of your birds. With a little thought and research, you can turn your yard into not only a great habitat for wildlife, but an enjoyable place to spend your time observing and listening to nature.